If you haven't succumbed to the DS Lite's embrace by now, we're not sure this pair of bundles will do the trick, and if you already have a DS Lite in your posse you're probably waiting impatiently for the DSi to traipse on over Stateside. 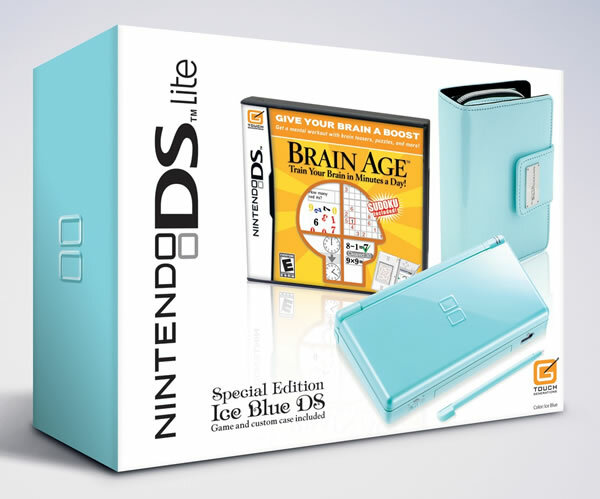 Still, we can't begrudge Nintendo's God-given right to bundle, and this Ice Blue Brain Age set (with custom carrying case!) and Mario Red New Super Mario Bros set (pictured, with emblazoned "M" logo!) aren't exactly unattractive. Both are being released this Friday -- that Friday -- for $150. The Brain Age bundle is pictured after the break.